Health care is another area that requires proper planning. Wyoming allows you to do this using advance directives. 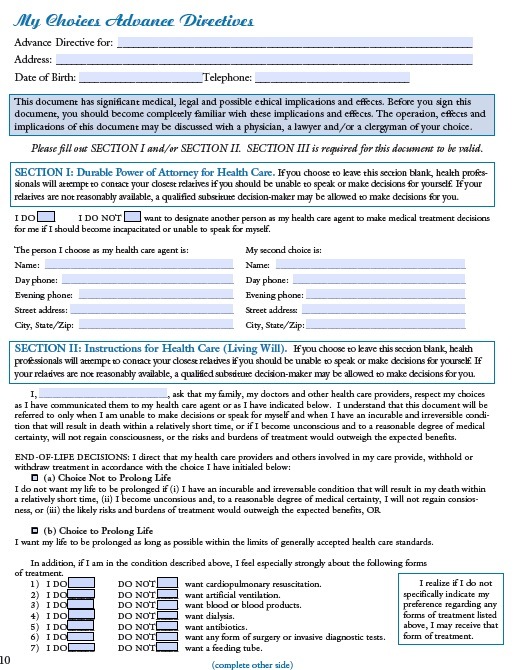 These forms allow you to give precise instructions about which medical treatments you’d like to receive if you unfortunately lose the ability to communicate adequately. They can also save your loved ones from added emotional pain associated with making difficult decisions about your healthcare. The medical power of attorney lets you appoint an agent to make all health care decisions for you if you cannot communicate. This generally includes any medical treatment decisions to affect your health, even the withholding of life support. You may limit the agent’s authority by writing specific instructions on the form. Wyoming also allows you to create a living will, which governs end-of-life decisions. In the event you suffer from a terminal condition or permanent unconsciousness, you may choose to prolong your life as long as possible or choose not to undergo life-sustaining treatments.